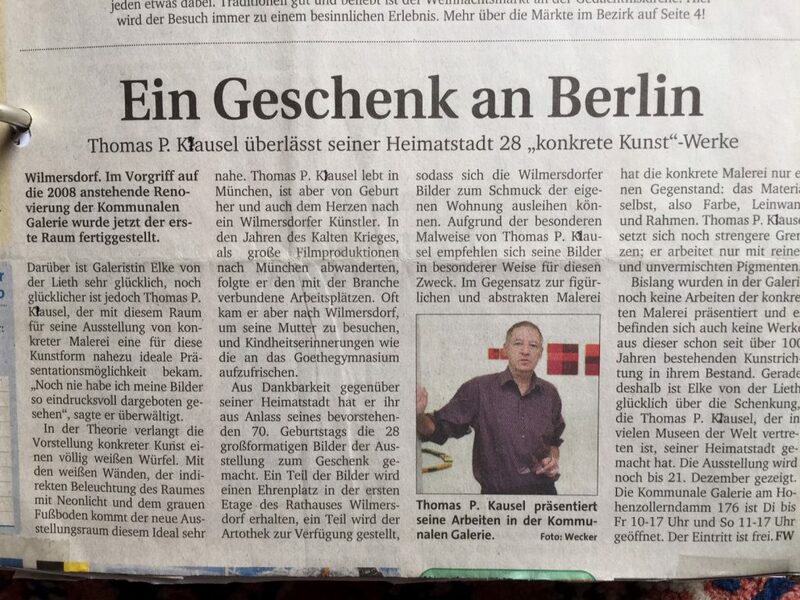 Konkrete Kunst – Ein Geschenk an Berlin, Thomas Kausel schenkt seiner Heimatstadt Berlin 28 Arbeiten mit konkreter Kunst. 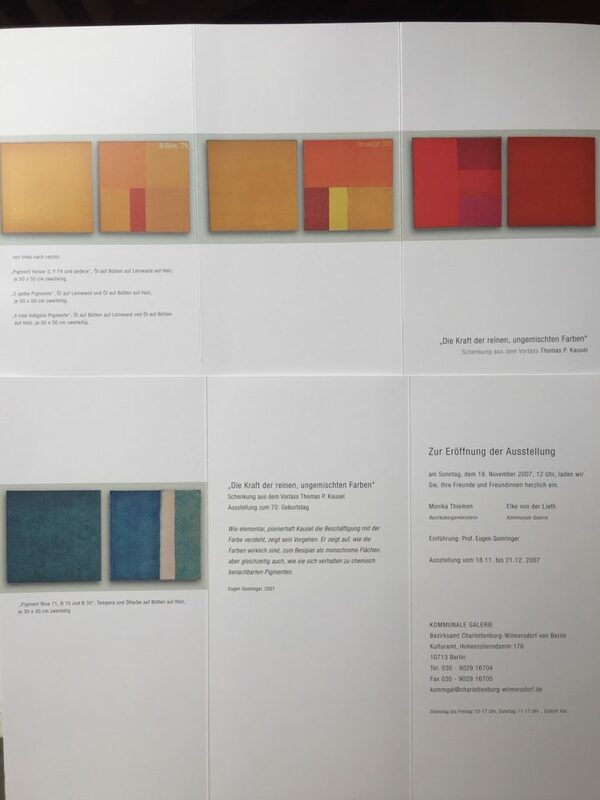 Ausstellung Kommunale Galerie Wilmersdorf-Charlottenburg, konkrete Malerei von Thomas P. Kausel. Bildgeschenk an meine Heimatstadt Berlin. much to many people’s surprise, one fine day in the 90ies, a new man entered the scene of Concrete Art which was in a downdraft then. His appearance seemed to say, no, he said it, too: „I’m here. I can tell you how painting in Concrete Art can be renewed.“ He freshened up art in theory and practice. Well, the artist is Thomas P. Kausel, a man from Berlin living in Munich and working globally from there. Whoever listens closely to the pulse of Concrete Art will agree: there is art before and after Kausel. 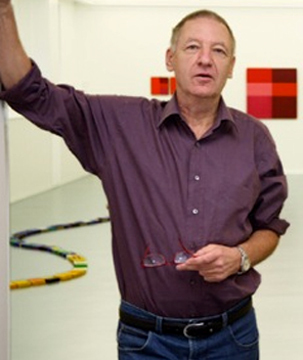 This artist has done more for art’s conscience than it might generally be known. Generally meaning Concrete Art has been around for approximately a hundred years, yet it is its characteristic feature to be considerate, quiet, sensible, not emotional and not at all loud and vociferous and playing to the gallery. So it is not easy to get to the front and to stay there. Kausel works so professionally that, so far, not only fellow artists, numerous gallery owners and exhibition organizers but also embassies and universities have lent him an ear and have invited him to a large number of exhibitions and workshops in and a long way out of Europe. Chile, Brazil, Hungary, England, Washington, India as well as Erfurt and Kirchzarten are on the list. You just have to see and listen to what Kausel has to offer. If Kausel’s exhibitions, however, are among the strong performances of art, this is not meant to be provocative. They are almost always appeals due to a multitude of unusual information he has worked out and passes on very cooperatively. But what is it all about precisely? A well-known artist once stated succinctly that it has already been tried several times to explore the process of painting in relation to the quality of the results to be achieved. Kausel’s matter-of-fact answer was: „but up to now a systematic table of the substances to be used for this, is missing.“ He supplied us with this table and gave us insight into the Colour Index, the globally obliging colour classification system, classifying all commercially important pigments. In a programmatic declaration he demanded that art should consider the colour classification system of the 200 highly lightfast pigments and include it. This does not mean the end of art but, on the contrary, its elementary new beginning. Concrete Art profits from Kausel’s example – he only paints with pure colours, only with the 149 unmixed, most lightfast pigments – an intense perception. He thus shows how colours really are, to be seen, for example, on monochromatic faces. The obligation towards traditionally performed Concrete Art is that Kausel comes in with the colours before a formal program, a geometrical concept or even a realistic image and thelike are available. Thus, for Kausel, the foundation of colour painting lies deeper than usual. It is the real concrete thing about Concrete Art. On another opportunity, the phrasing comes to mind: art from top to bottom. Even a term such as Abstract Art is not wrong, either. Kausel’s occupation with colour and art is understandably just one big search and experiment. However, he also tries to conceptually picture the continuance of a painting, an artwork as matter-of-factly and correctly as possible. There is hardly another contemporary artist who exceeds him in this matter or speaks his mind as clearly as Kausel. 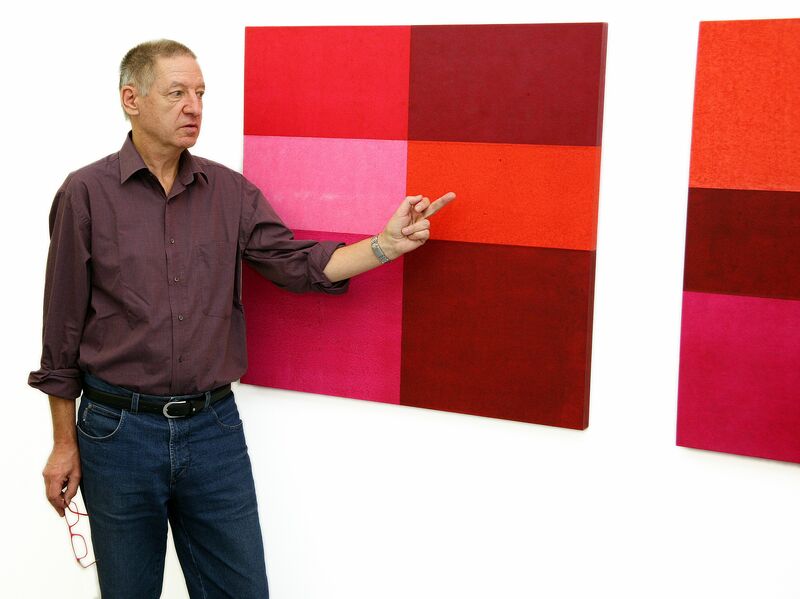 The only one he measures up to is Josef Albers, the Bauhaus master, who, with his work „Interaction of Color“, directed the view to the facts, the actuality of art, in order to bring out the determining basis for the acts, the effect of colour, as well. 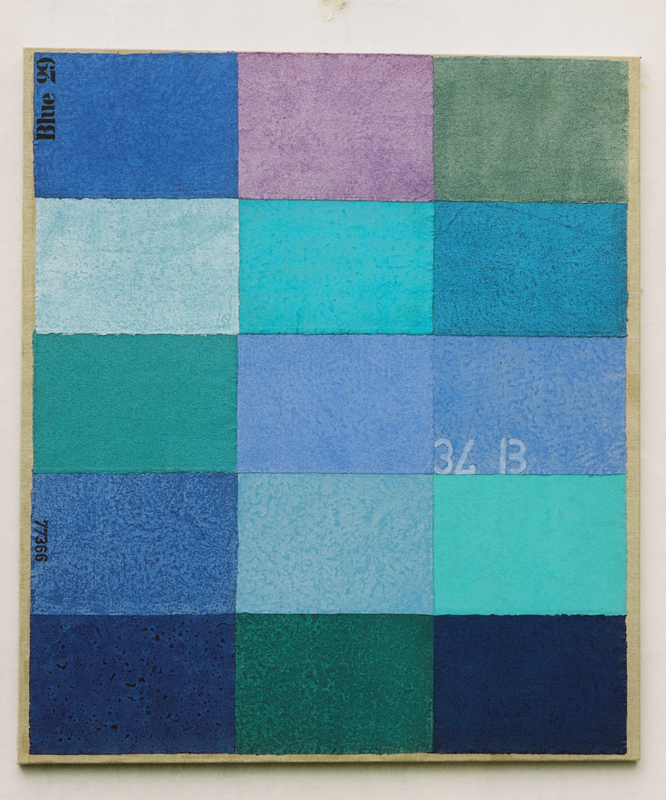 In his very own way, Kausel has already answered one chapter of this work that sees Albers in search of the „bluest blue“. We have a new artwork of Kausel at hand. 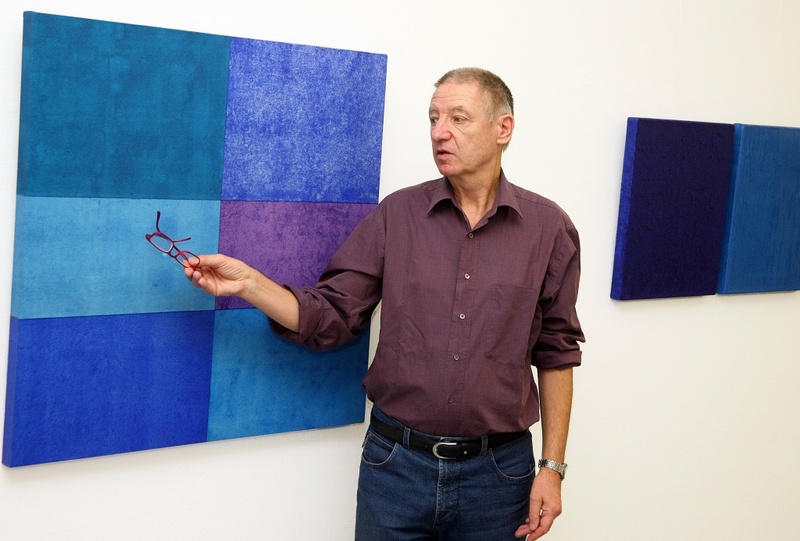 It is called „There are only 15 types of blue“ and is painted in oil on handmade paper. It is the portrayal of the 15 blue pigments. The picture is divided up into 15 equal rectangular fields in 5 rows. Kausel describes it exactly in the correct order of the chemical structure beginning top left with the anorganic three types of ultramarine blue. In the second row, he names zircon-cerulean blue, barium-manganese and iron-cyan blue. In rows three and four, he notes: everything cobalt and the last row has three types of organic blue. 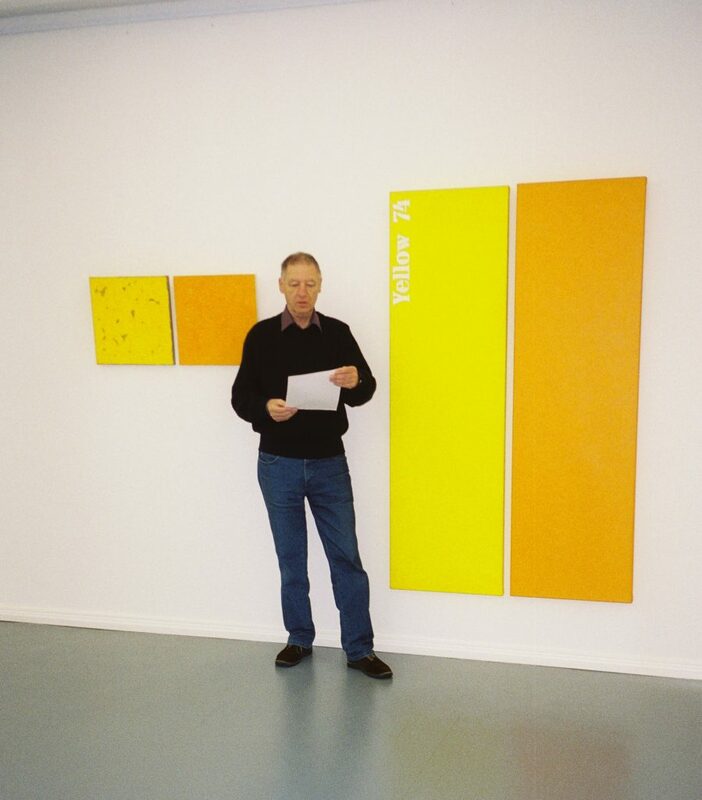 Another type of artwork he developed, consists of two tables. On the left, it says:“Colour Chords“, on the right „B28 monochrome“. The monochrome pictures are enticinlgy beautiful because they only show colour; colour, however, not in the painted and speculative way monochrome paintings are often brilliantly painted in. Moreover, Kausel even tells us what pigment is concerned, „Blue 28“. For this, he uses the stencil script which also decorates transport containers. It is labelling only, not meant to be central theme of text and picture. In doing so, he might sometimes write a letter in the wrong direction just for the fun of it. This increases the attention on the figure, the pigment, the entire artwork. Let us one more time be as exact as Kausel is with us. He sometimes paints pictures of which he wants the optical appearance to be more important than chemistry. These are colour collages that give him the freedom, no, he takes the liberty to create the choice of colours more freely, while not all of these pigments belong to the same „class“. But slowly! This, either, is not a relapse into painting as it is usually carried out. Kausel can take this liberty due to his knowledge and his sense of responsibility. As you can see, ladies and gentlemen, the paintings, the colours are more lively than the chemical protocol can make us imagine. 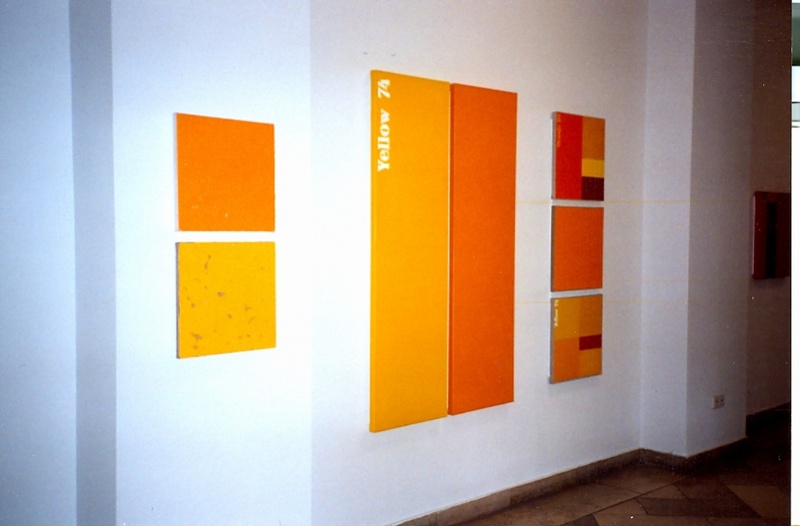 According to Kausel, an object on the wall first is a piece of canvas covered with colour but in fact, it is far more than that. Bauhaus master Josef Albers is right, too, when he sees the actual facts as a result to be gained from the factual facts. Today, there is nothing we would find more exciting than the dialogue between Kausel and Albers. However, their career is completely different. 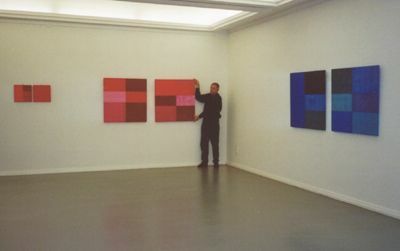 Albers discovered the relativity of colour in many tests during his education and in dealing with the experiences of his students. Kausel, as already mentioned, born in Berlin in 1937, was director of photography for film and tv and free-lance photographer. For his further education, he took part in numerous courses of the Salzburg Summer Academy. The series of teachers is very considerable but this information is really stunning: master student at Hermann Nitsch (action painting). And yet an effective synthesis can be recognized from the opposites director of photography and action painting, which means a close look, an exact examination of the material and its achievement along with a simultaneous joy in the material. It is a synthesis which enables us to experience colour in a new way and in a special directness which we eventually expect as an answer to our sensual experience. Nowadays, hardly anybody uses colours so focused on us and so straight like Kausel. In the same way he penetrates his papers with the colours, he also works on us: scientifically correct and in an undreamt-of emotionally insisting way.